They commissioned me to create an imagemark that Goethe-Institut locations across the country could use to promote the initiative. As you’ll see, we went through a lot of ideas before arriving at a final image. 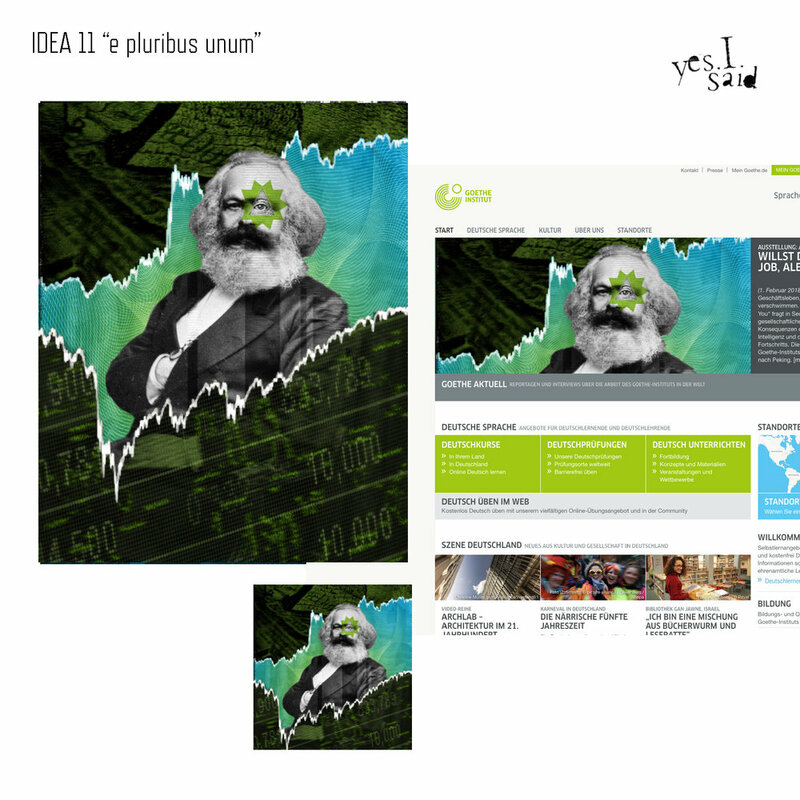 “As all Goethe-Institutes in North America will launch a project about Karl Marx in May 2018, we need you to create a design mark/picture mark for this project. It is important that this design mark is a picture (not a logo) which can be used as a banner for the website on the one hand, and for the illustration of e-blasts, newsleers and flyers on the other hand. Therefore, it needs to work in horizontal format (for the website banner), as well as in square format. 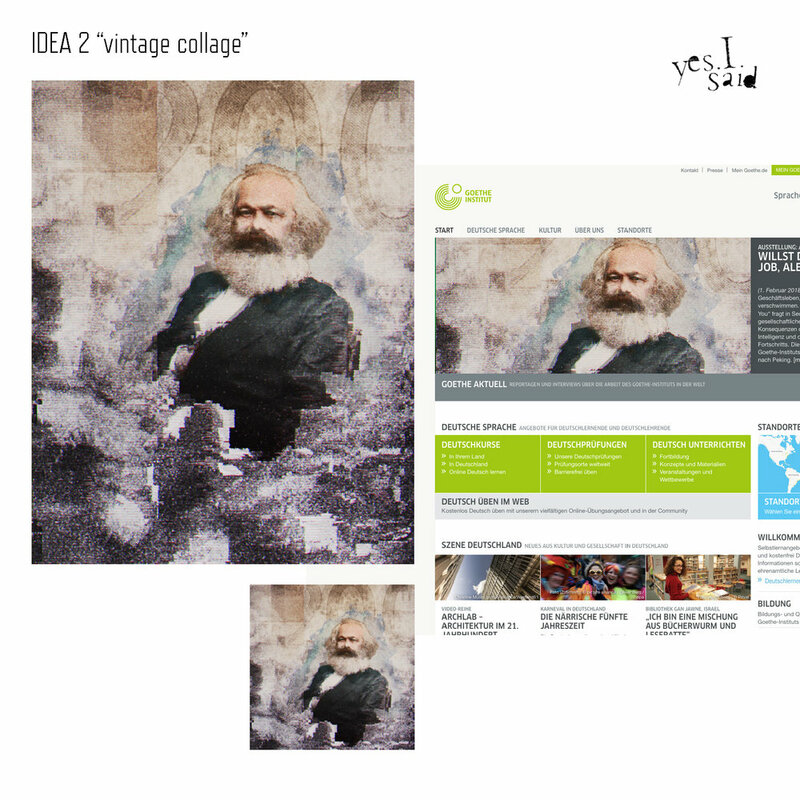 A first idea that came up is a pixelated likeness of Marx. However, you are free to come up with other ideas. We are thinking about something more simple. For example they should not have too many lines but a bigger accentuation (a main focus within the mark). 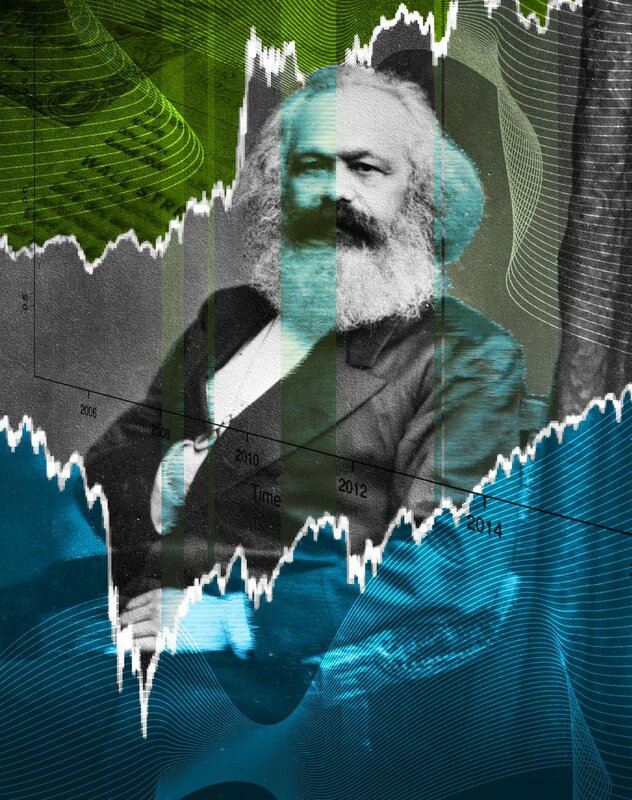 Moreover, it should be related to today’s world in some way, since the title is “Marx Now”, and also related to the United States (e.g. the U.S. stock market). …we like the ideas 8 and 9, as well as the idea 4 (“spectrum”) from the first round. 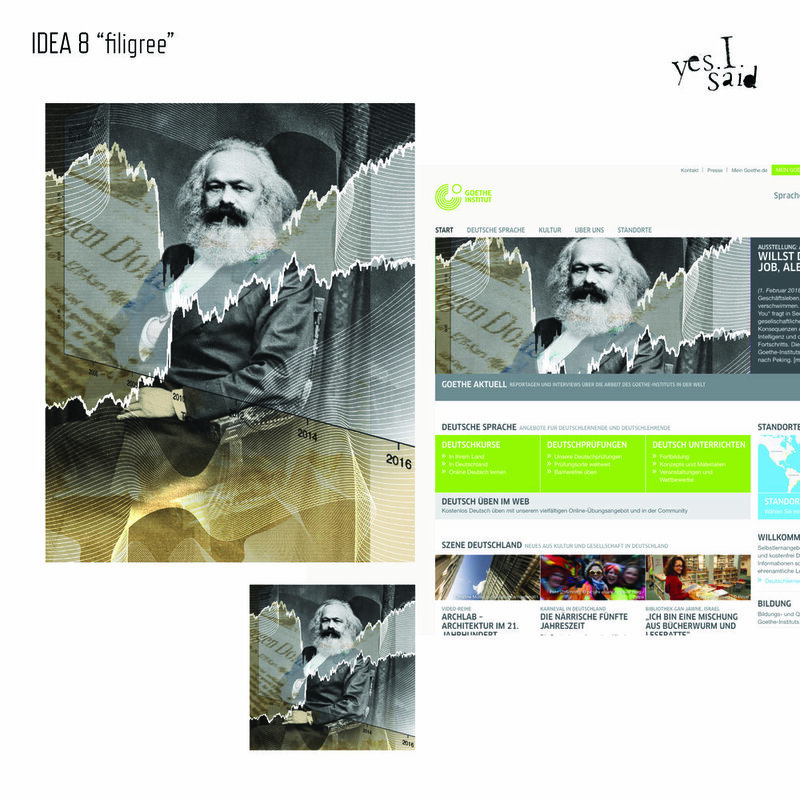 We like about ideas 8 and 9 that you included the stock market. Idea 4 was our favorite in terms of colors and also in terms of the “glitch”-look (the broken/wasted look of the image that fits in very well with the system at that time). It is very difficult for us to agree on one of the ideas because everyone likes something else. However, we decided that we would like to ask you if you could come up with another idea which is a mixture of idea 4 (colors that fit to the colors of the Goethe-Institut and the “glitch”-aempt) and idea 8 or 9. So a combination of abstract stock prices, glitch-style and the colors of the Goethe-Institut would be perfect. We decided that we like the idea 8 “filigree” the most, but we still want you to change a few things about it, if possible. It is very important for us, that the CI-colors of the Goethe-Institut appear in the image mark. Maybe you could only take 2 from the Goethe CI-colors (e.g. green and light blue/turquoise) and combine it with grey, so that it is not that turbulent and colorful but a lile more simple. Could you somehow adjust the draft of idea 8 regarding these colors? Moreover, we would love to have the “glitch”-style added to this idea 8 as well.